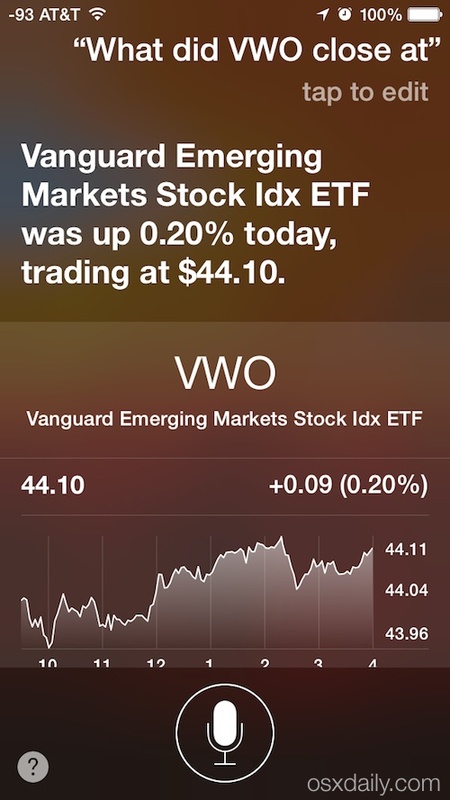 You may already know that you can add stock ticker symbols to the Notification Center on the iPhone, but if you don’t feel like tapping around, another option is to retrieve information on markets and equities through Siri. 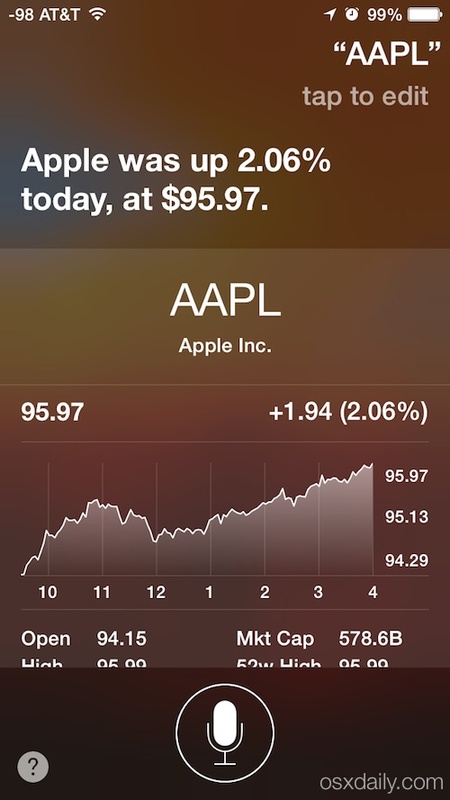 That also means you can get detailed stock market data on prices, highs and lows, dividends, and more, not only an iPhone, as is the case with the notifications option, but also on an iPad or iPod touch. For all of the ticker symbol specific inquiries that pull up a chart (that is, not going through WolframAlpha immediately), you can scroll down to reveal additional market data on the individual equity in question. This includes a days chart of price activity, the open price and days high and low, volume, market capitalization, P/E ratio, the 52 week high and 52 week low, the average volume over the year, and the dividend yield if there is one. 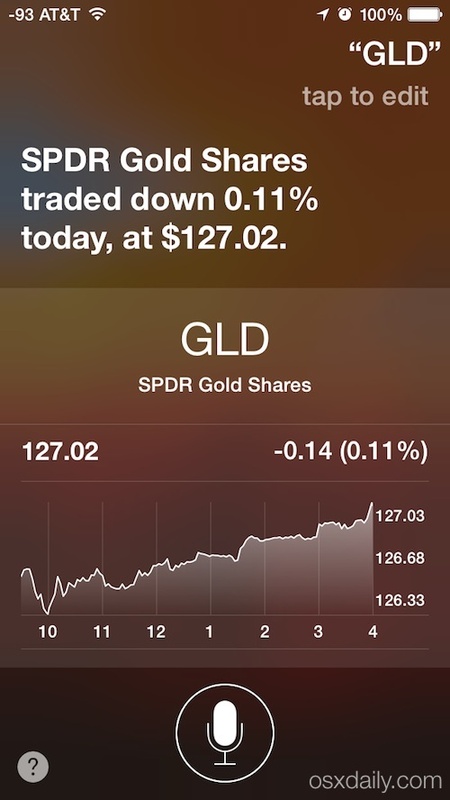 How useful this data is for you is debatable, but it is undoubtedly one of the fastest ways to get quick stock and market data from the iPhone, iPad, or iPod touch, particularly if you’re in a conversation and don’t want to start flipping through your iOS device. 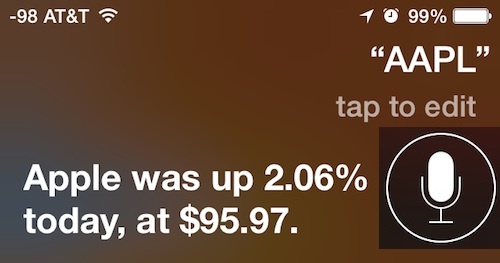 Is Siri going to replace something more insightful like a dedicated trading app, or the Bloomberg Pro app for iOS that many professional financial observers use? Almost certainly not, but for quick bites of data, it should be good enough for most casual market observers. 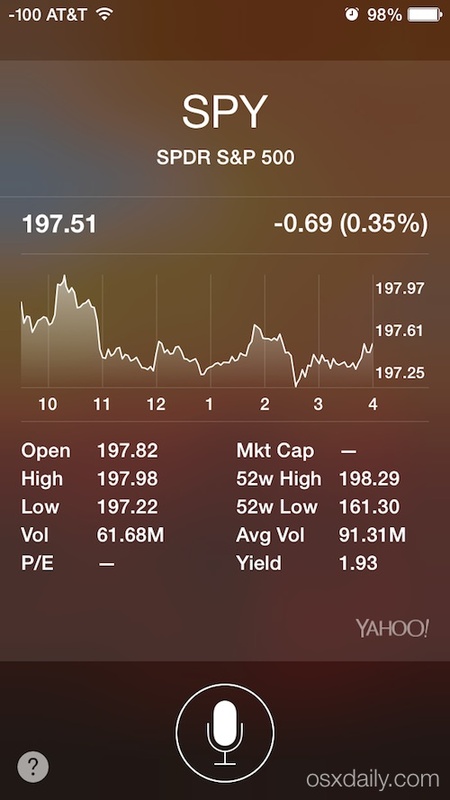 I would like to include what the 10-year Treasury bond closed at each day on the “Stocks” app on my iPhone 6. Can anyone advise what symbol might exist for that and/or how I might phrase a question to Siri that would obtain that info?